Lock in a great price for Waterton Glacier Suites – rated 8.4 by recent guests! It was comfortable and the staff was very inviting. The room met expectations the staff was very friendly and it was a fine value. Loved the National Park! Been visiting Waterton since the late 90s, but never stayed in the townsite itself until I tried this place. Will do so again. Great location -- just off the main strip so it's a little quieter, but less than a 5-minute walk from everything. The suites are clean, modern, and very comfortable (vaulted ceilings are a great touch). Fridges, microwaves, fast wi-fi, and comfortable beds. The staff are excellent. Stay here every year. Love the log cabin feel and fireplace in the winter. Everything was great. We would stay there again. Had supper at their restaurant and the food was good. Thanks for a great night getaway for us! Very comfortable room, nice jetted tub and fireplace. Walkable to every where in Waterton. Beautiful scenery all around. Lot's of animal life in the area and great outdoor trails. April is a very quite time of the year for Waterton Nat Park. Not a lot to do in early spring. Loved the deluxe suite, it was so cute and cozy! It was also so clean and had the most beautiful view! The location was perfect, staff friendly, restaurant had excellent food, and the tub was awesome! Waterton Glacier Suites This rating is a reflection of how the property compares to the industry standard when it comes to price, facilities and services available. It's based on a self-evaluation by the property. Use this rating to help choose your stay! Surrounded by the mountains of Waterton Lakes National Park, this all-suite hotel is less than 5 minutes from the Waterton Lakes Golf Course. It offers suites with spa bathtubs. 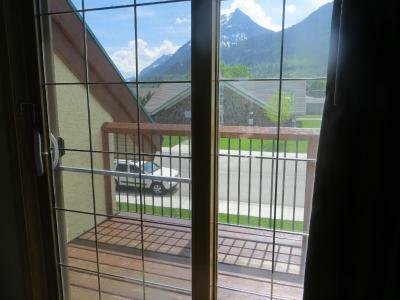 The suites at Waterton Glacier Suites are furnished with a fireplace and balcony. They come with cable TV, a DVD player, and free Wi-Fi. A laundry room and business center are on the property of this Waterton hotel. The Bayshore Inn, the partner hotel of Waterton Glacier Suites, is a 5 minute walk away and hosts an on-site spa, gift shop, and restaurants. Waterton Shoreline Cruises is a 5 minute walk from Glacier Suites Waterton. Cameron Falls is a 10 minute walk from the hotel. This property is also rated for the best value in Waterton Park! Guests are getting more for their money when compared to other properties in this city. When would you like to stay at Waterton Glacier Suites? A microwave, fridge and coffee-making facilities are featured in this spacious suite. Free Wi-Fi and cable TV are included. A living area has a fireplace. A spa bathtub is included. A microwave, fridge and coffee-making facilities are included in this room. Free Wi-Fi and cable TV with DVD player are provided. Featuring a flat-screen cable TV and free WiFi, this 2-level suite includes a Murphy bed. A separate living room offers sofa seating and a fireplace. A refrigerator, microwave, and coffee machine are also provided. A spa bath is included. House Rules Waterton Glacier Suites takes special requests – add in the next step! Waterton Glacier Suites accepts these cards and reserves the right to temporarily hold an amount prior to arrival. Guests are kindly requested to note that due to the remote location of Waterton (AB) there are no grocery shops or gas stations open from mid-October until mid-May. Please contact the hotel for further information. Smell in the room from their cleaning supplies, irritating horrible smell. Jacuzzi shutting down every 5 minutes ( with time set to 30 minutes) , sounds like a self resetting breaker was tripping.Second floor was too hot to sleep with thermostat set to minimum. I don't think I will come back because of the smell. Room was clean, fireplace, nice room layout with balcony. Room was very postcard like , views were amazing !! Scent in the bathroom was strong. We couldn't get rid of it by opening the doors. My wife has a chemical sensitivity and she had a reaction because of the scent. Water pressure and temperature could be higher. Bed very comfy, room very clean. Only small issue was not a lot of hot water for jacuzzi. My husband and I found the bed to be hard to uncomfortable. However, we would stay again, due to the many positives. The staff didn't seem eager to repair faulty equipment or to catering to customers. The remoteness of the property. Great place for a peaceful scenic retreat. The Romantic suit was beautiful. The Fridge was set too cold and it froze everything in it. It was also a steady 23 Degrees in the room, even though I turned the thermostat off since we wanted it cooler.